My first video blog! Hope you all enjoy it. These may happen more and more, but I’m not sure I’m happy about it. Does anyone enjoy watching videos of themselves? I sure don’t! I thought I’d had some long days: I hadn’t even come close to a true long day. Today, I left the house at 7:00 a.m. and didn’t get home until 11:00 p.m. For the mathematically challenged, that’s 16 hours. 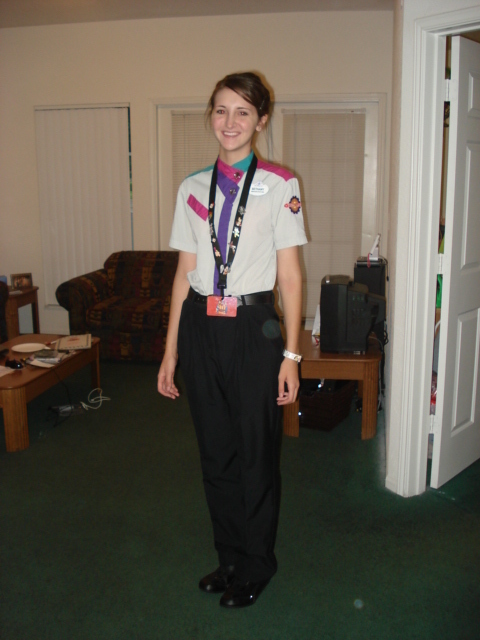 I worked a total of 12 hours – 6 in Discovery Island and 6 in Frontierland at Magic Kingdom. I have to say, though, that today was really great. Stocking at DAK went really quickly and smoothly. Before I knew it, I was on my way over to Magic Kingdom. All I can say about MK vs. DAK is…wow. At Animal Kingdom, Cast Members park in a designated lot right next to guest parking, and walk in in the same area as the guests. We walk on-stage to get to our work areas, only going backstage once we reach our destination. At Magic Kingdom, Cast Members have to contend with the infamous Utilidors, the underground tunnel system beneath MK. Cast Members park very, very far away at MK, and take a bus to the entrance of the tunnels. Then you walk forever, through color coded tunnels, to get to your destination. You store your things in lockers in the tunnels, take the elevator up, and get completely into character before stepping on-stage. It really is a whole different experience. After going to get my special issue costume and finally figuring out how to get on-stage, I had a little time to kill before work. So I wandered around Adventureland, Frontierland, and Liberty Square (in street clothes, of course.) I caught the end of the “Celebrate a Dream Come True” parade, shopped, and watched the Pirate Tutorial in Adventureland. This little show was such an unexpected treat! It’s a street show, where Captain Jack Sparrow and his assistant come out and teach the kids in the crowd how to win a swordfight, Captain Jack-style (by running away! ), and make them Official Future Crew Members. Both Captain Jack and his assistant were very good, and of course the kids were adorable. They finished off the show by leading the crowd in a sing along of “Yo Ho, Yo Ho, A Pirate’s Life for Me”. The whole thing was too cute, and definitely a pleasant way to pass a little time. I highly recommend stopping to watch if you ever pass by a show in progress. Once I finally got to work, I rotated between Big Al’s (an outdoor stand), the Frontierland Trading Post (a Pin Trading Center) and Prairie Outpost (candy and other treats). I had an absolute blast! Working in Animal Kingdom, sure, there’s a theme. We say things like “Have a Wild Time!” and talk about how we’ve heard that there’s a Yeti hiding in the mountains, and just generally staying in character. But working in Frontierland, I was really able to unleash my inner drama queen. I’d greet people with a great big, “howdy!”, call kids “sugar” or “pardner”, and make any of the kids buying toy guns promise me that they wouldn’t use ’em to hold up any trains. I sort of created a character for myself, and I loved every minute of it. I was a rootin’, tootin’ frontiers-woman! The costume in Forntierland is also way cuter than the one on Discovery Island, although it isn’t as comfortable. I was really disappointed that I was getting so few hours, but now I”m thinking it could be a good thing. I had so much fun tonight; I’m going to pick up Extra Hours every chance I get!